Order your coffee from the palm of your hand with the convenience of being able to order anywhere you like! No lines, no waiting. On your way to work, shoot through an order and pop in to pick it up- it's as easy as that. 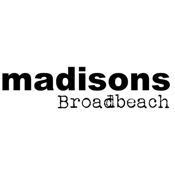 The famous and award winning Madisons Cafe in Broadbeach will have you coming back time & time again. Perfect for those who are driving past, living in the area, or work in Broadbeach. Don't waste time waiting in lines- order everything you need from the palm of your hand.